I would like 500HP only I would like it to sound some what mild, not stock just not crazy loud. No fire breathing dragons. I have been reading a lot on these forums about going to a 408 stroker, which sounds promising. Another option which I have been reading about is the Paxton supercharger. These seem to deliver on the HP, but what about fit. Can a supercharger be dialed back so as not to over stress the block? I would like to hear some feed back on which way may be the best direction to go, best bang for the buck without destroying the block. Paxton will never fit in front of the engine in a Pantera. You could mount it in the rear with a jackshaft; how much money or talent do you have? Pop-off valve can be used to limit boost. Stroker is a much simpler manner to get HP. 500 FWHP is attainable, just depends how much you want to spend and if you want to give up the engine cover screen. Archives are searchable, if you haven't already done so, try more research in this forum. And you will lose the use of your trunk tub, or have to heavily modify it. I believe this one is driven off of the flywheel. It's not difficult to make 500 HP with a normally aspirated 351C, especially if you stroke it. Big $$$$ for forced induction on a Pantera. Stroke a Clevor or Windsor for best "bang for buck"
Thanks guys, looks like I'm going for the stroker kit. I will say that of all the car forums it seems that the Pantera people are the most helpful and inventive. I have seen some AWESOME looking cars on this site!! You'll need to find a quality engine builder as well, if you're not going to build it yourself. I am planning to do it myself, I have rebuilt a couple engines in the past. If I get in trouble, I have an ace in my pocket. My neighbor owns a machine shop and has done a few race engines. I will have him balance and check over everything before we go zoom zoom. I vote 408, unleash the beast!! I looked at superchargers and turbos when rebuilding my engine. 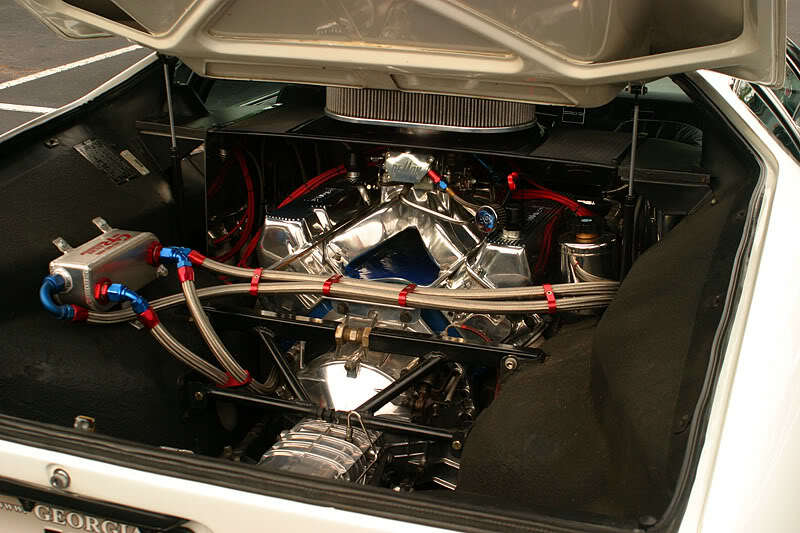 Eventually I settled on the 408 stroker as the best way to get horsepower that you can use. Docile in traffic. A monster when unleashed. 522 HP with 510 ft lb of torque. It runs on pump gas with 10.5 compression and has never - read NEVER - failed me in 10 years of road trips and hard driving. Reliability with limited, regular maintenance. And still blows away all the F-cars, Porsches, Lambos and anything else you're likely to come up against on the street. What more can you ask for from an exotic street car? Dave's cat is definately "show AND go". He drives that car the way it was meant to be driven! That is one nice looking engine. I could live with 522HP. What heads are those? I have not pulled the heads off the motor yet, I expect them to be open chamber 4V and not worth using. Jay, those are Blue Thunder heads. I see a lot of them on this board. Click on my website below (panterapassion.com) then click on the Isis logo, then Details, then Engine Build. All the parts and specs are there. I highly recommended this package. Good luck and post pics as you go. Garth can you put me in touch with the owner of the Vortech Supercharged car. That isn't a Paxton, I have a Novi 2000 on my Mustang and know these blowers well. Looks more like a J-Z Trim Vortech. I am very interested to see how they rigged up the flywheel to the blower shaft.